July 10, 2003 - Danderyd, Sweden - The funeral of Prince Carl Bernadotte,92. He was cousin to Carl XVI Gustafs grandfather and he lived in the village Benalmadena in Spain. He is mourned by members of his family. He was also a popular relative to the royal familys in both Norway and Sweden. The funeral took place in the church of Danderyd (a suburb to Stockholm in Sweden) attended by his family and relatives. The Royal family of Norway attended also as well as the Swedish queen and king. Picture of Mette-Marit and Haakon attending the funeral. July 10, 2003 - Mette-Marit and Haakon attending the funeral of Prince Carl Bernadotte. Prince Carl's third wife, princess Kristine Bernadotte died on Tuesday 4th November in her home in Benalmádena in Spain. She was 82 years old. Princess Kristine Bernadotte's funeral will take place (the date is yet to be announced) at the Royal Chapel of Drottningholm Palace. Members of the swedish and norwegian royal family are attending to the funeral. Since she was very close to the norwegian royal family, I expect many of them to attend. 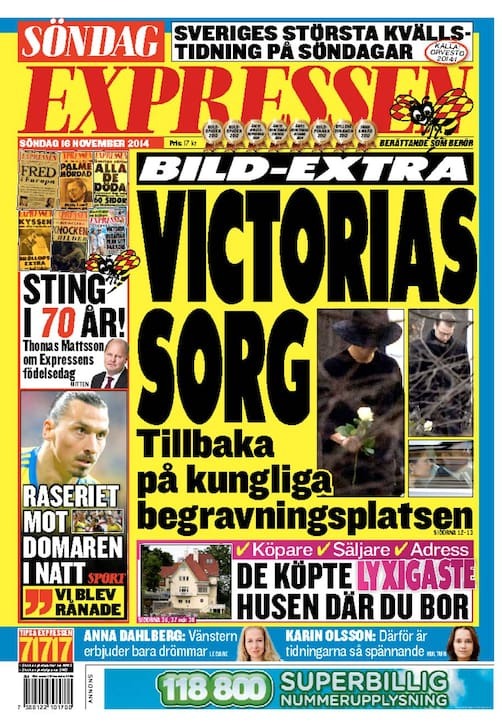 Margareta Thorgren from the press department tells that the king and royal family have been informed about the death of princess Kristine Bernadotte. Thorgren says that she was a distant relative of the king and of course the king has sent his condolences. I wonder if any of the Belgian Royal Family or of the Luxembourgian Grand Ducal Family will attend her funeral, as the Princess was an aunt of the late King Baudouin of Belgium, of King Albert II of Belgium and of Grand Duchess Josephine-Charlotte of Luxembourg. I think i read somewhere that at the funeral of Prince Carl Bernadotte Queen Paola and Grand-duchess Josephine Charlotte attended, but not a big repesentation of both families (not like the norwegian or swedish RF), so i'd expect similar for this funeral? Prince Carl was Queen Astrid's Brother . I don't know how is the relationship with his third wife . I don't know either how is their relationship with Countess Madeleine Bernadotte, Prince Carl's only daughter from his first wife. Countess Madeleine married the Belgian late Count Ullens de Schooten and divorced. Their Children were always invited when there was a remembering about Queen Astrid. King Albert had a new surgery and Queen Paola has to stay with him. The King Albert Ii will not attend the King's Feast on November 15th but well Queen Paola, Princess Astrid , Prince Lorenz and Princess Claire. Princess Kristine Bernadotte (l) with prince Carl's daughter Madeleine Kogevinas (r) and countess Marianne Bernadotte at king Carl Gustaf's 40th Jubilee last year. It is sad for Countess Madeleine who lost her second husband Mr Kogevinas also. Countess Madeleine looks like a classy lady and every inch the princess she almost is. Two of her great-grandfathers where Kings, a third was a Count and belonged to one of Swedens most prominent noble families, two of her aunts married future Kings, another aunt is Swedens only non-royal duchess... She has a lineage that's hard to beat even in the top royal circles these days. It is very touching that Princess Kristine was an important person to Prince Carl's children and grandchildren. King Carl Gustaf, queen Silvia, crown princess Victoria and prince Daniel attend at the service in memory of princess Kristine Bernadotte at the Drottningholm Palace Chapel followed by the funeral at the Royal Cemetary at Haga. Their Majesties The King and Queen will attend the Service in memory of Her Highness Princess Kristine Bernadotte in Drottningsholm Chapel followed by the funeral at the Royal Cemetery at Haga, Stockholm. Their Royal Highnesses The Crown Prince and Crown Princess, and Her Highness Princess Märtha Louise and Mr Ari Behn will also be in attendance. No-body from Belgium and Luxembourg ?. Nobody from Belgium, I believe, since on that day the Royal Family will be busy with the King's Feast. As for Luxembourg, nothing has been announced officially. Victoria and Daniel, and the norwegian royal family arrived in the morning to Drottningholm Palace to the funeral of princess Kristine. The court singer Loa Falkman sang at the funeral. It's is very nice that the whole NRF came for the funeral.